Interview originally published by SFScope.com on 9/10/2010. This isn’t your standard, everyday interview. This is The Assistant interviewing the Bosses, bosses who just happen to be New York Times Bestselling Authors Nancy Holder and Debbie Viguie of the Wicked Series and the new Crusade Series. Why have the assistant interview the bosses? Why me? Well, because I know where all of the dirt is and I know where they hide the bodies. Who better to interview these writers than the person who knows them best? 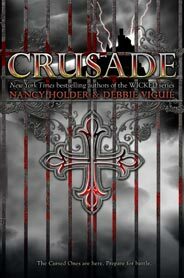 So, here it is, the inside scoop on the ever so wicked Team Crusade, Nancy Holder and Debbie Viguie. Q: The first few books in the Wicked Series were out for a while before hitting New York Times Bestsellers List. What was it like to find out your novels were New York Times Bestsellers? DEBBIE: I screamed until I lost my voice. I called all of my friends and screamed in their ears and they couldn’t even understand what I was saying. So, I had to hand the phone to Scott so he could “translate”! The funniest part, though, was I got the news first. Our editor called me at home to congratulate me and then I saw the news in my email. Nancy wasn’t home when our editor called her, so I called her cell to tell her the good news. And this was the best part of the entire thing. She didn’t believe me! First she thought I was kidding her. Then she thought I just misunderstood. She made me stay on the phone with her until she could get home and check her email. And then… we both screamed. And you know what? We haven’t stopped! NANCY: I had just climbed into my car from a trip to the post office. I started to back out of the parking space when my cell phone rang. It was Debbie. She said hello, then paused, and said, “You don’t know, do you?” Then she told me we were on the NYT. She’s right; I didn’t believe her. I thought maybe it was the extended list, or some sub-list. I was so flummoxed that I couldn’t make myself put the car in reverse, so I crossed about six parking spaces horizontally while I kept Debbie on the phone. Other drivers were staring at me like, “What the H are you doing? !” I went home and stared at my computer. I also noticed that our editor had left a voice mail for me. I finally started to believe it. Q: You both have successful individual and coauthor writing careers. How does the writing process change when working with a coauthor? How does the story benefit from two sets of fingers on the keyboard? What are some of the pitfalls or dangers that may come up with the two of you working on the same piece? DEBBIE: I don’t have to write the parts of the story I don’t want to, I just make Nancy do it. 🙂 Seriously, when one person is struggling with a particular section or character we can pass it back and forth until we’re both happy with it. The biggest danger? Version control. Keeping straight the most recent copy of any given section and making sure we’re not both editing the same bit at the same time. NANCY: Version control. Yes. Today I complimented Debbie on a character’s name and she laughed and said, “You came up with that.” Then I convinced her that she came up with it. But as I’m typing this, I think maybe I did come up with it. But as you can see, that’s not the important thing to us. What is important is getting the character’s name right. Q: Nancy, you have a massive collection of short fiction, most of which is now difficult to find. Do you have any stories that you’d love to breathe new life into? Q: Debbie, one of the things that your Wicked fans and Crusade fans may not know is that you also have a successful career writing Christian fiction. How has writing in these two genres benefited or detracted from your writing as a whole? How has this dual experience influenced your storytelling? DEBBIE: Although I’m certainly not the only writer to write in both the secular and the Christian markets, some days it feels like it! I think one of the things that has benefited my writing is that I blur the lines a little more than I might otherwise. For example, I have secular fiction that tackles religious themes or has religious characters. At the same time, I write religious fiction that’s easy for people who aren’t religious to read because I believe that it should be a natural part of the character’s lives and not the sole focus of the story. My story comes first and religion helps and informs the character’s thoughts and decisions. I have atheists reading my religious fiction and Christians reading my secular fiction. In that way I think I’ve got the best of both worlds and I’m excited that I can make stories which appeal to a broad audience. Q: In the words of The Assistant, your new novel Crusade is nothing short of the opening for an epic urban fantasy on a grand scale, featuring a large cast of characters who are wildly different from each other. What excites you most about taking on a large project like this? What scares the heck out of you when starting an expansive story? DEBBIE: I love epics, I like being able to be swept into that universe. Getting to write one is exciting because I want to try and sew the seeds in the first book that will bear fruit in the last book. You can build an entire plot twist in book three off of a single sentence in book one. I love that. I get scared sometimes because with such a large cast and sweeping plot there are a lot of balls in the air and you don’t want to drop any of them. I hate that feeling where you realize you meant to add a little bit more here or tie this loose end up better there. NANCY: I get that overwhelmed feeling when I think about all the themes and character issues we take on. As Debbie says, we don’t want to drop any balls. Every time you introduce something, it’s a promise to the reader that you will follow through on that idea/character/plot point. Q: Crusade was inspired by a short story called “Passing.” Why this story? What was it about “Passing” that inspired you to write not just a novel, but an entire series? DEBBIE: We ended up doing so much world building in that short story that we realized we had far more story than we had words to write it in. When we finished writing it, we loved the characters so much we realized we needed to take that start and make it the foundation for a new series. NANCY: What Debbie said. It was a very exciting moment. Screaming ensued. Q: In your new novel Crusade, do you have a favorite moment in the story? Or a scene that you loved writing? Or something that broke your heart? DEBBIE: The answer to all three is the same scene, the one where Jenn is betrayed. NANCY: I agree with Debbie. My heart breaks often for Antonio, as well. Q: Often times it is the villain who creates the need for the story and causes the readers to fear for the well-being of the hero. Who would you say is your all-time favorite fictional villain and why? How would that villain stack up against the Crusade villains? DEBBIE: Darth Vader from Star Wars episodes 4-6. I was 4 years old when I saw Star Wars: A New Hope in a theater. When he walked through the smoke and appeared on screen, I leaned over to my father and asked if that was Satan because I knew he was evil. My father whispered back that he didn’t know, but thought he just might be! Ultimately, we discover that Vader wasn’t always evil. This is the case with Aurora in Crusade and I think that makes for a compelling villain: a basically good person who has been twisted around and turned into a monster. Of course, I don’t see a shot at redemption in Aurora’s future! NANCY: Debbie, maybe Aurora will be redeemed. It’s a thought! I loved Tim Curry in Legend. He reminds me of Chernobog, who is truly a gorgeous villain (the demon in “Night on Bald Mountain” in Disney’s original Fantasia. And what kind of vampire person would I be if I didn’t love to hate Dracula? Q: Do you have any juicy story tidbits from future Crusade novels? Is there a nugget or two about Jenn and her friends that you can share with readers? DEBBIE: Hmmm… Juicy. Well, for readers of our Wicked series this will probably come as no great shock, but brace yourselves anyway: Someone is going to die. NANCY: How can I top that? Someone else will survive! Q: All right, one last Crusade question. Are you a Hunter or a Cursed One? DEBBIE: I’m going to cheat. Hunter by day. Cursed One by night. I guess that makes me Antonio! NANCY: Cursed One by day. Hunter by night. If only. That would mean I get to nap while my daughter’s at school. But I do like to stay indoors out of the sun. Which is weird, since I’m a native Californian. Nancy, Debbie, thank you so much for agreeing to be interviewed. NANCY: My pleasure. Now, where’s the twenty? The Cursed Ones are here. The Hunters are coming. Prepare for battle. Crusade hit local bookstores and online shelves on September 7, 2010. Nancy Holder has published sixty books and more than two hundred short stories. She has received four Bram Stoker awards for fiction from the Horror Writers Association, and her books have been translated into more than two dozen languages. She has written or cowritten twenty Buffy and Angel projects. 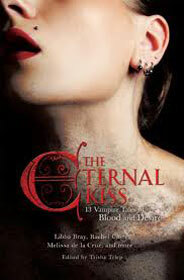 Her books from Simon Pulse include the New York Times bestselling series Wicked and the novel The Rose Bride. A graduate of the University of California at San Diego, Nancy is currently a writing teacher at the school. She lives in San Diego with her daughter, Belle, and their growing assortment of pets. Visit her at www.nanacyholder.com. Debbie Viguié holds a degree in creative writing from UC Davis. Her Simon Pulse books include the New York Times bestselling Wicked series and the Once upon a Time novels Violet Eyes, Scarlet Moon, and Midnight Pearls. She lives in Florida with her husband Scott. Visit her at www.debbieviguie.com. This entry was posted in Books and Literature, Fantasy, Interviews, Uncategorized, Young Adult Literature and tagged crusade, Debbie Viguie, fiction, interview, nancy holder, New York Times, The New York Times Best Seller list, wicked. Bookmark the permalink.